The Kingdom of Tonga lies about two-thirds of the way from Hawaii to New Zealand. A South Pacific archipelago, consisting of one hundred and seventy-six islands, that never completely lost its indigenous governance and still remains the only monarchy in the Pacific today (CIA Retrieved on 11/2009). Comprised of three major island groups; Tongatapu, Ha’apai, and Vava’u, a total of fifty-two islands that are inhabited, with the majority of the 104,509 (2011, World Bank) people living on the main island of Tongatapu where the capital city of Nuku’alofa is located. Tonga's political history is colorful and marred by problematic economic decisions, often driven by attempts to increase national revenue. In 2006, rioting broke out in Nuku’alofa, precipitated by parliament adjourning for the year without having made any advances in increasing democracy in government (Fonua, 2006). In 2008, Forbes magazine named Tonga the sixth most corrupt country in the world. In the same year the constitutional monarchy of Tonga braced for change as King George Tupou V announced he would relinquish power over to the people of Tonga as a new Parliament is to be, and was elected by the people in 2010 (BBC Retrieved on 11/2009). Characterized by a large non-monetary sector and a heavy dependence on remittances, 70% of Tonga's economy relies on half of the country's population who live abroad (chiefly in Australia, New Zealand, and the United States). Many development plans have emphasized the growth of the private sectors and such plans have put Tonga as the 165th safest investment destination in the world in the March 2011 Euromoney Country Risk ranking. The Kingdom of Tonga is a land of unequivocal natural beauty. From high volcanic islands to coral atolls, it's lush tropical ecosystem hosts high species diversity, much of which is endemic; species that are adapted to specialized habitats and limited to small areas of a few islands (IUCN Retrieved on 2013). 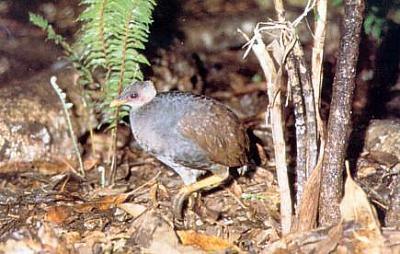 Like the fascinating and endangered Megapode (Megapodius pritchardii), a flightless bird who lays their eggs in is warm volcanic sand and rock to incubate instead of sitting on them. Tonga's total land area (699km2) is not even 1% of it's total marine area (700,000km2) (Lovell, E.R., Alaki, A.P.). While the megapode hides in Tonga's forest ecosystem, which only comprises 12.6% of the countries land mass, 1,139 identified marine fish species and 218 coral species can be found in coastal waters (NBSAP, 2010), but these are not the only animals that await you below the surface. Each year thousands of southern hemisphere humpback whales (Megaptera novaeangliae) annually migrate along the coast of continents from their Antarctic feeding grounds for their northern seasonal breeding and calving grounds in Oceania. One of the private sector growth industries here is tourism and swimming with humpback whales has become a major attraction for the country. However, it wasn't always this way. At the beginning of the twentieth century, southern hemisphere humpback whale numbers were thought to have been 120,000. However, that estimate is conservative considering 160,000 were reportedly killed from 1900-1963 and the additional 46,000 that were illegally slaughtered by Soviet Union whaling ships between the years of 1947 and 1973 (Clapham 2008; Clapham 2009; Eyre, L.). This assault on the humpback whale populations precipitated the closure of shore whaling stations in Australia and New Zealand in the early 1960’s (Clapham 2008) and many of the whales killed are thought to have been from the Tongan population (Eyre, L.). In an attempt to regulate whaling, the International Convention for the Regulation of Whaling was signed in 1946 and from that the International Whaling Commission (IWC) was established. In 1986, the IWC adopted a no whaling policy and in 1994 created the Southern Ocean Whale Sanctuary, where all types of commercial whaling are banned. Though, through special permits allowed by the IWC, so called ‘research whaling’ still takes a number of whales from the Southern Ocean, including Megaptera novaeangliae. Despite Tonga’s own history of subsistence whale hunting, the Kingdom of Tonga put a moratorium on whaling in 1978. 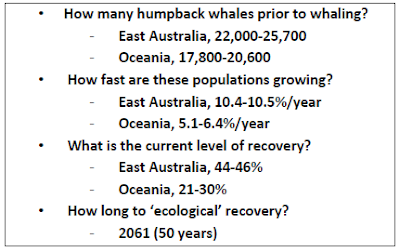 In spite of this, the Tongan humpback whale population has shown little recovery from whaling, even though the east coast of Australia population has exhibited a noticeable increase (Noad 2008). This might be caused by several factors, including the possibility that the individuals killed for research in the Southern Ocean by the Japanese are part of the Tongan population of humpbacks, although this is just speculation. The population in Tonga has been reported to be around one thousand individuals (O'Connor 2008); however that figure is still under investigation. In 1993, the first whale watch company was established and the Tongan Fisheries Conservation and Management Act was enacted (O'Connor 2008). Since then, the whale watching industry has boomed to thirteen tour operators throughout the island groups, ten of which are located in Vava’u. The growth of the industry spurred the establishment of the Tonga Whale Watching Operators Association and the creation of the Whale and Dolphin Watching Regulations of 2003. The growth of the industry saw a forty-nine fold increase of whale watchers between the years of 1994 and 2006, from two hundred to over nine thousand (Hoyt 2001). 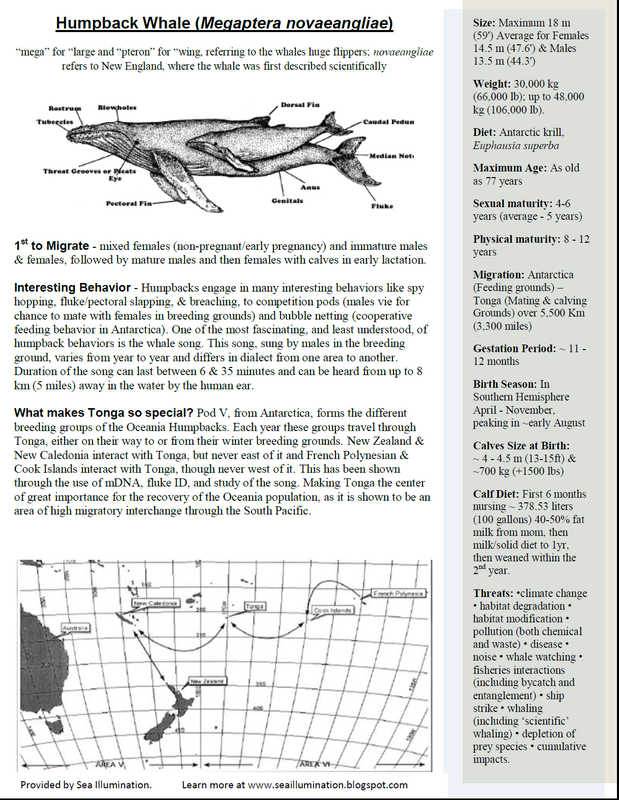 As of 2007, the total expenditures of tourism comprise fifteen percent of Tonga’s total Gross Domestic Product (GDP) (O'Connor 2008), humpback whale watching being a major attraction. With a thirteen percent unemployment rate and twenty-four percent of Tonga’s population residing below the poverty line (CIA Retrieved on 11/2009), the growth of tourism acts in a vital role, making up-to eleven percent of the labor force (O'Connor 2008). The growth of the tourism sector is ongoing, though it is thought that Vava’u has reached its carrying capacity with regard to whale watch tour operators and subsequently no further whale watch licenses have been granted since 2006 (O'Conner 2009). One of the major draws for whale watchers to Tonga is that, in Tonga, whale watchers are allowed to swim with the whales. Under the conditions of a whale watch license, operators are permitted to take passengers into the water with these gentle giants. This very uncommon practice in the whale watching industry has given Tonga a competitive edge and sparked a debate about best practices for the industry and the whales. Before there were regulations, voluntary guidelines were implemented and followed among the Tongan whale watch operators. Broad stakeholder, government and operator, input assisted to their development, trial and evaluation in the late 1990’s (O'Connor 2008). Since that time, the guidelines have been adopted under the Tourist Act of 1977 and have been passed as legislation. The regulations manage the whale watch industry in Tonga through licensing tour operators. 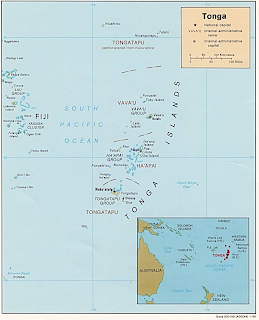 In 2006, there were a total of fourteen licenses in all of Tonga, thirteen in Vava’u alone (O'Connor 2008), although, the number of licenses often fluctuate to some extent each season. The regulations are in place to manage the whale watch industry and to secure a sustainable future. The regulations have adopted guidelines not unfamiliar to those found in other whale watching industries from around the world. The official guidelines for watching whales in the Kingdom of Tonga, for instance, dictate approach methods, proximity to whales, and number of vessels per pod. In Tonga, it is illegal to swim with whales without a licensed whale watching operator. The regulations allow the carrier of whale watching licenses to operate a maximum of two vessels per license and only these licensed operators may put up to four swimmers and one guide in the water with the whales at a time. Special interaction permits and licenses are also given to scientists and professional commercial filmmakers/photographers who must adhere to the guidelines established in those permits and licenses. All vessels, both private and commercial, under power or under sail, operating in Tonga during the whale watching season must remain outside a three hundred meter radius of a sighted whale. Only licensed whale watch operators may be within three hundred meters of a whale. 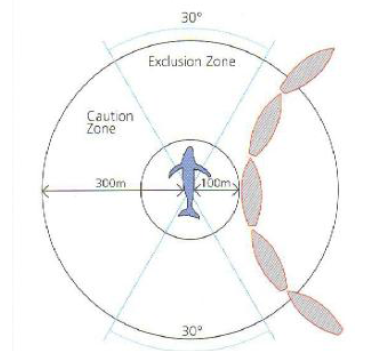 Approach of the whale must run parallel to the animal(s), leaving room for the whale to leave should it want to, and must not approach any closer than one hundred meters and never block the movement of the animal(s). There are also bans on the use of SCUBA equipment, artificial light sources, jet skis and motorized swimming aids when interacting with whales. The use of helicopters and remote control aircrafts for whale watching is also banned. Whale watching by aircraft is limited to a five kilometer range, five minutes or two approaches, and must maintain a minimum height of three hundred meters from a whale. This tightly regulated industry in Tonga has not only become a major tourist attraction for individuals, film makers (including the BBC's Wild Pacific) and researchers, but has become the whales strongest voice for conservation and protection. 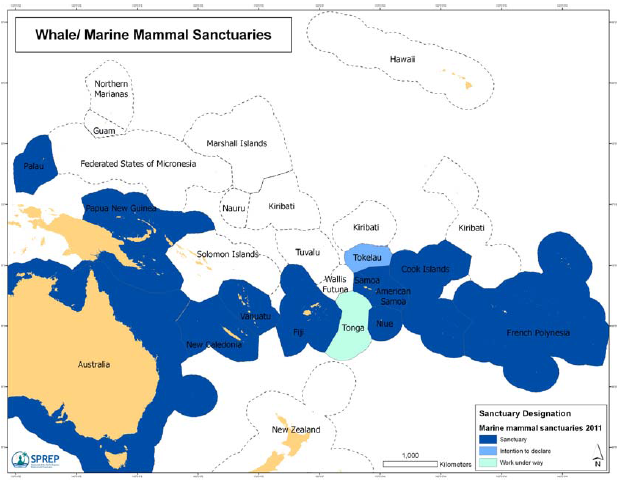 "Oceania's humpback whales are of global conservation concern having recently been re-classified from 'Threatened' to 'Endangered' by the International Union for the Conservation of Nature (IUCN)" (OHWRP, 2011). The Oceania Humpback Recovery Plans' vision is to promote the conservation and recovery of Oceania's humpback whale population to 50% pre-exploitation abundance or doubling current population within 10 years. This 5 year plan includes 14 countries, Tonga being one of them, and 16 dependencies or territories. This August I will be guiding tours in Tonga through Swimming with Gentle Giants. To join me follow the link to their website. 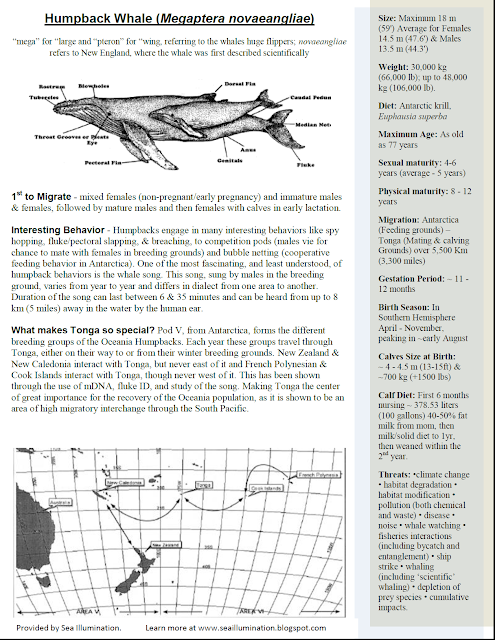 To learn more about these whales and current conservation efforts go to Oceania Humpback Whale Recovery Plan.